Feed the birds in your garden with these homemade fat and seed balls. In winter the birds that visit your garden need extra nourishment to keep them warm on cold nights. Children love to engage with wildlife, so why not try making these bird treats with them, so that you can all enjoy an aerial display of the birds flying in and out, and hanging from your chosen feeder? All you need is vegetable or beef suet or lard, plus bird seed mix. Mix one part suet to two parts seed, transfer to a saucepan and gently heat, stirring until the fat melts. To make fat balls, use an ice cream scoop, or mould with your hands, into balls. Space apart in a plastic container or on a tray and place in the freezer to set firm. Once the fat balls are solid, put in the garden, on a bird feeder or in a fat-ball feeder. Reuse empty yoghurt pots to make hanging feeders. Make a small hole in the bottom of each pot and thread some string or twine through the hole in the bottom and out through the top of the pot, leaving it long enough to tie the feeder to a branch. Put the fat and seeds in a saucepan and heat gently until the fat has melted. Pour the mixture into the yoghurt pots, stand in a tray and leave to set overnight in the fridge. Carefully remove the empty pot from the fat and hang the feeder from a tree. Tie a length of ribbon or twine around the top of pine cones. Roll them in melted fat, then roll in seeds. Place in the fridge to set. Hang the pine cones from a tree. For a more natural looking feeder suspend a gnarly log from a tree branch. Push the fatty seed mix into its crevices and holes. Use an empty plastic drinks bottle to make a loose seed feeder. Make a couple of small holes in the bottom, to allow any water to drain. Use the drill, a heated metal skewer, or twist away with a pointy-ended implement. Using the same method, make a hole about the size of an egg, about halfway up the bottle. Fill the bottle with seed to just below the hole. The birds will perch on the edge of the hole to feed. Unscrew the lid of the bottle, make a hole in it and thread through a length of twine, or a hook twisted from wire, and hang up. Take a plastic plate or the lid of a plastic box to make a tray-style feeder. Make four evenly spaced holes around the edge, thread through four equal lengths of twine or string and tie together at the top so that the tray is suspended horizontally. Knot the ends of the twine together over a branch. Sprinkle the tray with bird seed. Core an apple, thread a piece of cord or string through the hole and tie to a stick across the bottom. This will be a perch for the birds. Fill the hole with sunflower seeds, and push more into the apple. Tie around a branch and wait for your feathered visitors. Don’t forget to provide a shallow bowl of water for birds to use for drinking and washing. Keep the area around the bird feeder tidy and remove any uneaten food. 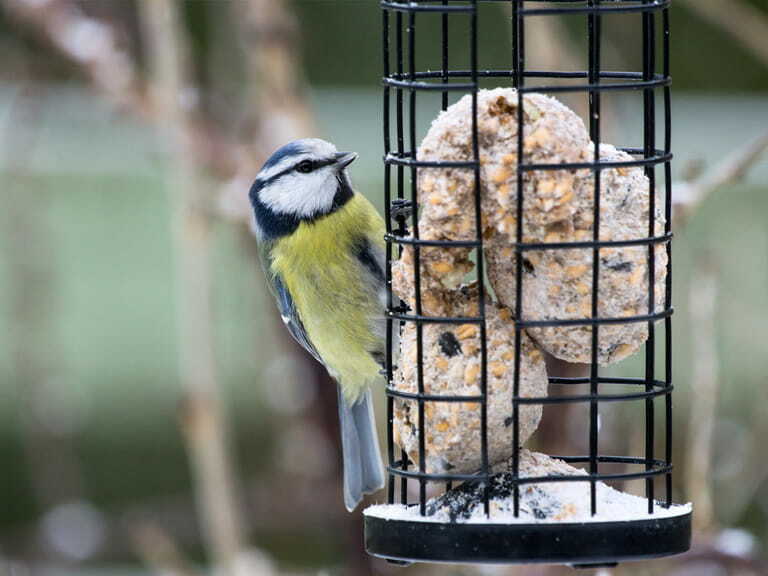 Make sure you keep feeding the birds as they get used to locations where they can find food, and will be regular visitors! Some foods should never be fed to birds, including the fat from a roasting tin, salted nuts, desiccated coconut and cooked oats.